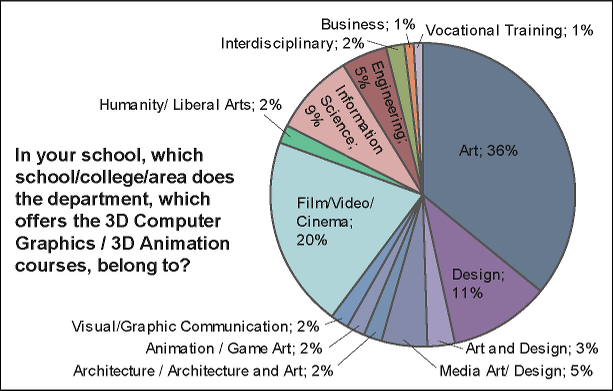 In this document we present the results of a survey of faculty members teaching in programs where course in 3D Computer Graphics and Animation are offered in the United States. The survey consists of 30 questions and was conducted on-line through Surveymonkey.com. Replies were solicited at SIGGRAPH 2010, via the website of the ACM SIGGRAPH Education Committee and the associated mailing list ‘cg-educators@siggraph.org’, and directly through e-mails. The survey was open from August 2010 through to January 2011. The survey was started with 105 respondents, tapering off to 77 who finished the entire survey. Respondents were allowed to skip questions. Without any further analysis, this document presents the result of the survey as graphs with the response count or percentage for each available option in the multiple choice questions. When under 'other' a specific answer was given a number of times, it has been included in the graphs as separate category with those answers not being counted towards the general 'other' category. The survey did contain a few open questions, for these similar answers have been grouped together in order for them to be tallied and presented in the form of a graph. A similar survey was conducted earlier in Japan. A comparison between the two surveys with more in depth analysis will be presented at SIGGRAPH ASIA 2011 under the title "3D Animation Education in the US and Japan: Different Environments, Similar Issues". The abstract for this sketch will be available through the ACM digital library. First we would like thank the faculty members who took time and responded to the surveys. Without their cooperation, this research were not possible. We would also like to thank the Computer Graphic Arts Society (CG-Arts) which conducted the earlier survey in Japan, and Marc Barr and the ACM SIGGRAPH Education Committee for allowing us to solicit responses through their communication channels. Please note: the comparison between the two surveys with more in depth analysis, presented at SIGGRAPH ASIA 2011 under the title "3D Animation Education in the US and Japan: Different Environments, Similar Issues" is available in the AMC Digital Library.